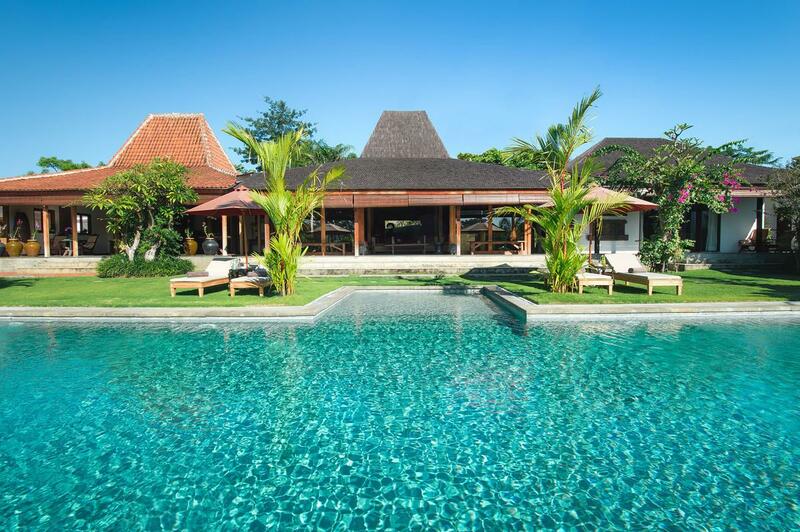 Set amidst pristine rice fields in Umalas, Villa 333 is a private boutique-style residence for guests seeking an elegant retreat with luxurious modern amenities. 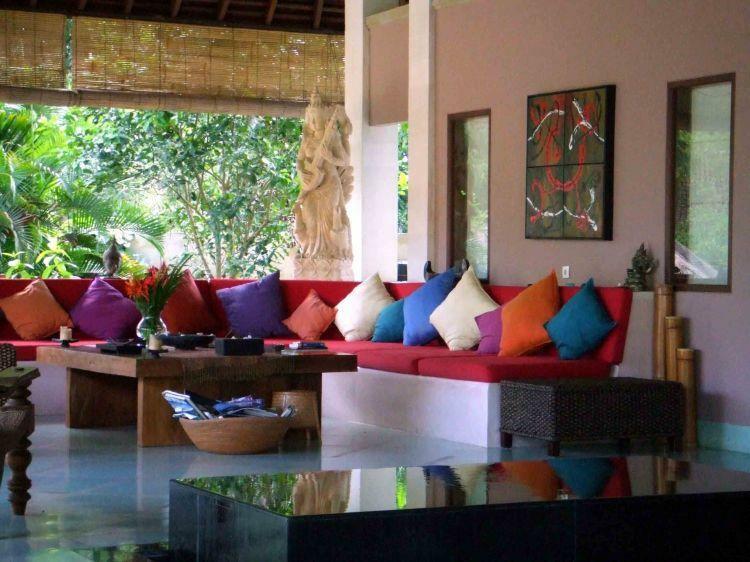 Located a leisurely 10 minute drive from Seminyak, home to Bali’s finest shopping and dining and only 25 minutes from the international airport, Villa 333 offers complete privacy yet is very accessible to Bali’s premium entertainment. 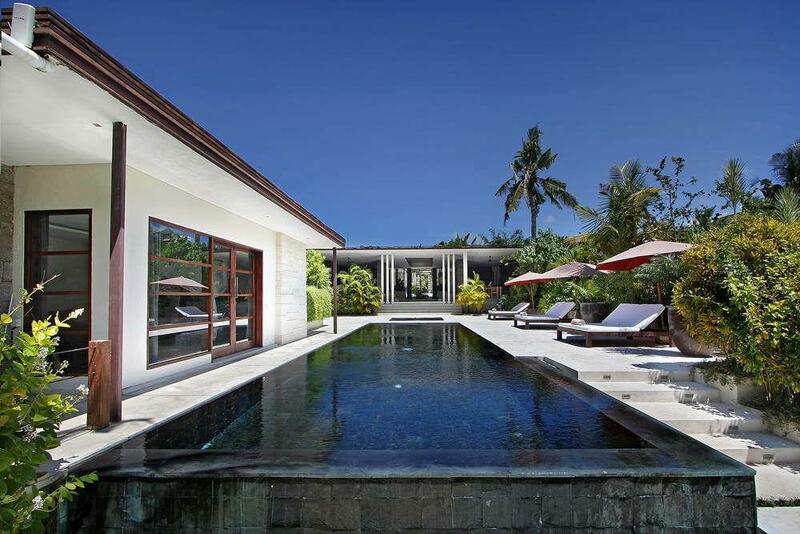 Conceived by Arte Associates and the villa owner, the design comprises three private, individual villas set on a half acre of landscaped terraced gardens. At the estate’s heart is located Pavilion Salsa, a spacious entertainment pavilion, which leads on to the impressive, blue-tiled infinity pool, around which the 3 private villas themselves are set in gardens resplendent with tropical flora.Villa 333’s architectural style reflects modern Balinese and Asian tones, and features elements of Feng Shui to create a sense of well-being and balance for the enhancement of any mood. 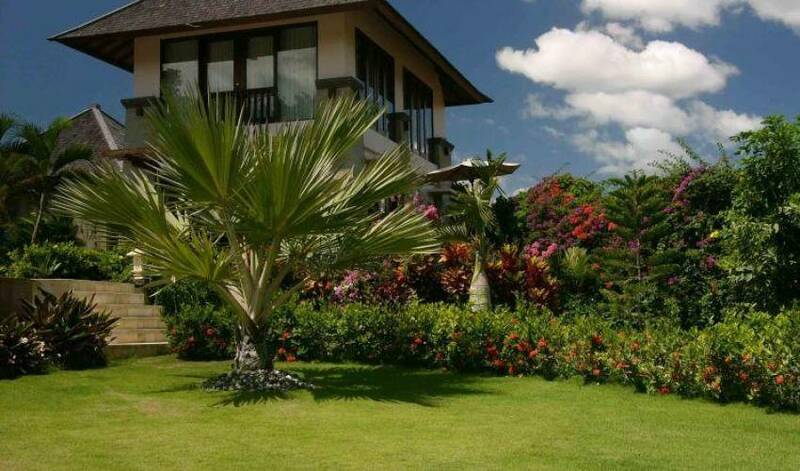 It also captures the essence and joy of indoor and outdoor living in a tropical climate, bringing nature to your door.Service is at the heart of the Villa 333 experience to make your stay most special. 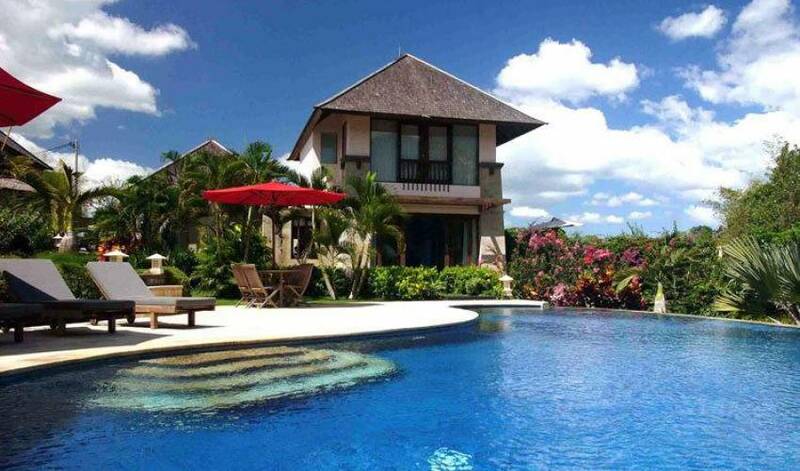 Luxury villas and amenities are complimented by the highest level of personal service afforded by Villa 333’s team. 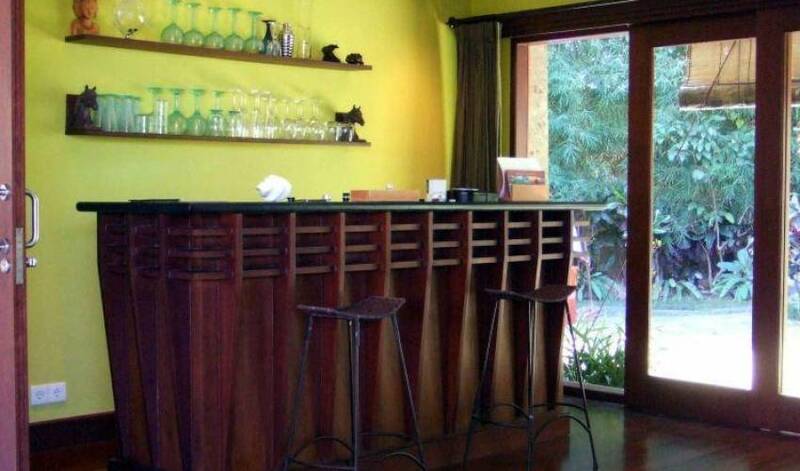 Allow them to attend to all your needs to make your stay most memorable and enjoyable. 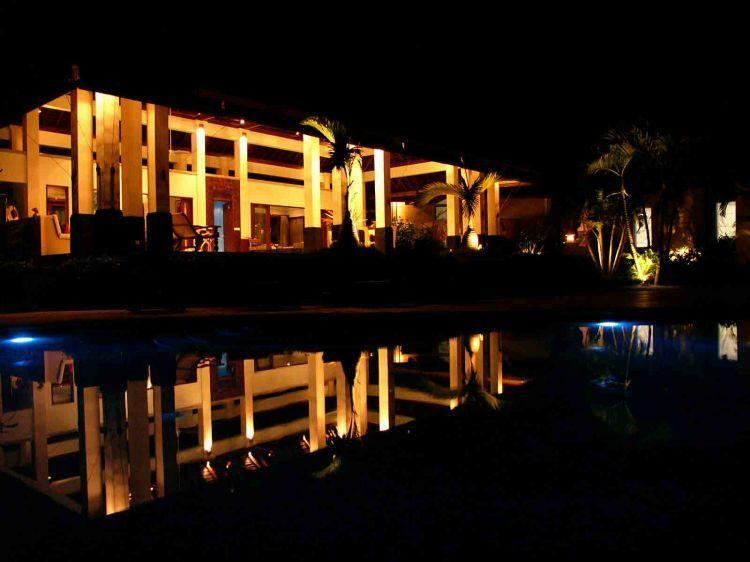 A spacious, open-air pavilion , Salsa persuades guests to relax and entertain. 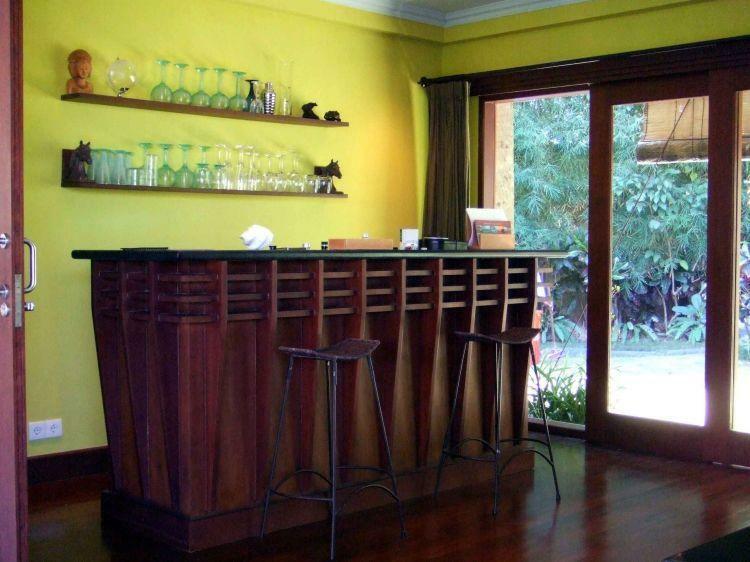 It houses a large, open lounge area with teak coffee table on one side, and, at the other a spacious dining area, all under wood rafter timbers set on tall stone columns. Its cool sea green terrazzo floor and black granite infinity pond soothe the senses. Behind the open air pavilion through sliding glass doors are the TV/Music room, equipped with DVD/CD, Satellite TV with libraries of books and DVDs, and, the Villa’s own bar salon for cocktails. 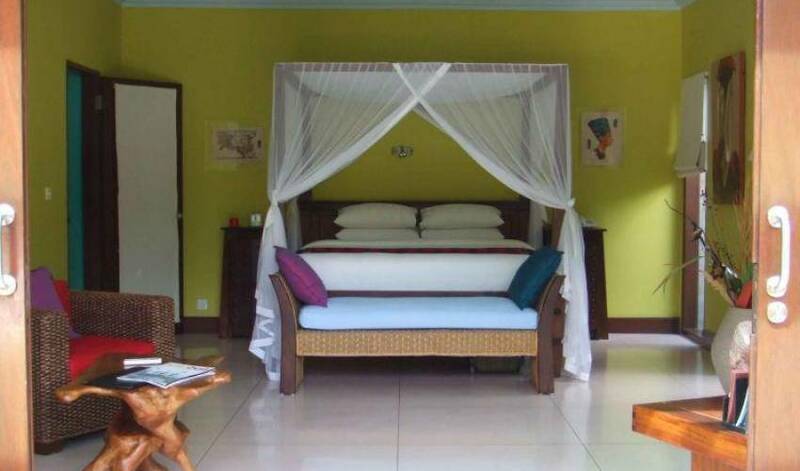 Laid with wood parquet floors and furnished with rattan style furniture, the mood is one of relaxation. 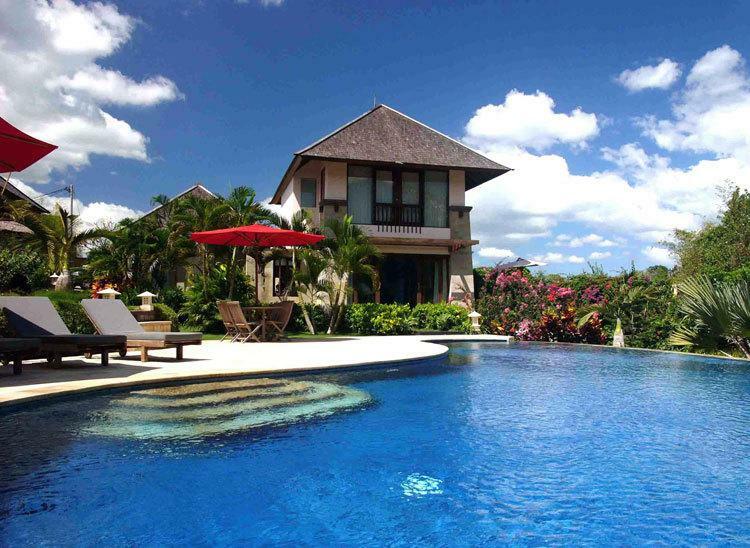 Pavilion Salsa looks down and across to the swimming pool and the three private villas on the estate. 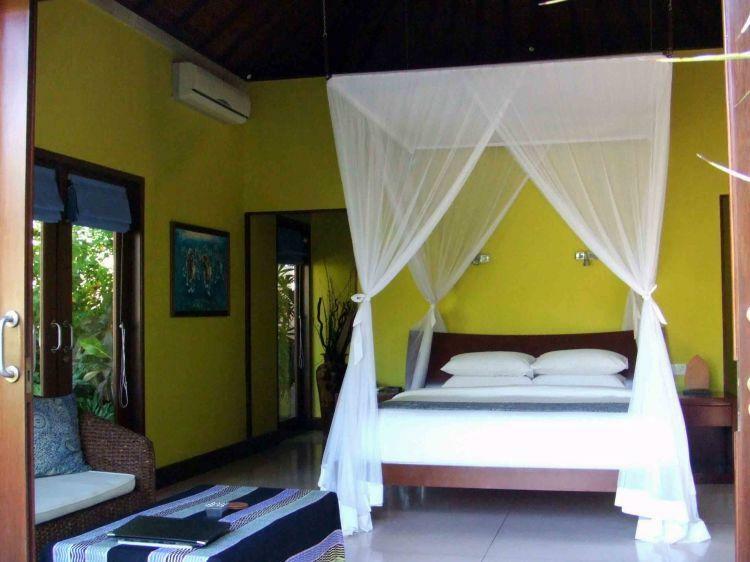 To the left of Pavilion Salsa, Villa Lambada is a 2 floor villa with 2 master bedrooms, dresser area and stunning indoor bathroom overlooking its private rear garden. A wood staircase leads guests to unwind in the lounge room which affords fine views over the estate. 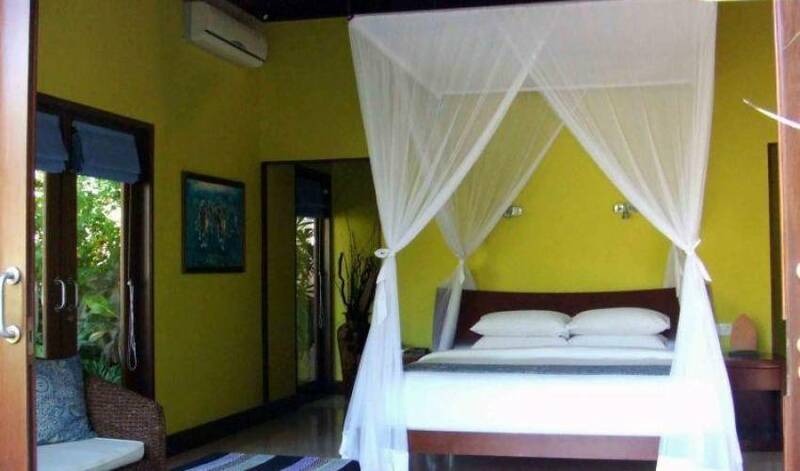 The Master bedroom is laid with terrazzo floor and comes with a four poster bed and canopy, chaise lounge, and comfy chairs, and TV with DVD/CD player. A spacious dresser leads to the private ensuite bathroom, boasting a large black terrazzo bathtub, twin vanities set in granite, shower and WC. The stunning azure blue terrazzo floor and walls set a relaxing mood.The lounge room can also become an optional fifth bedroom as it features an ensuite bathroom. 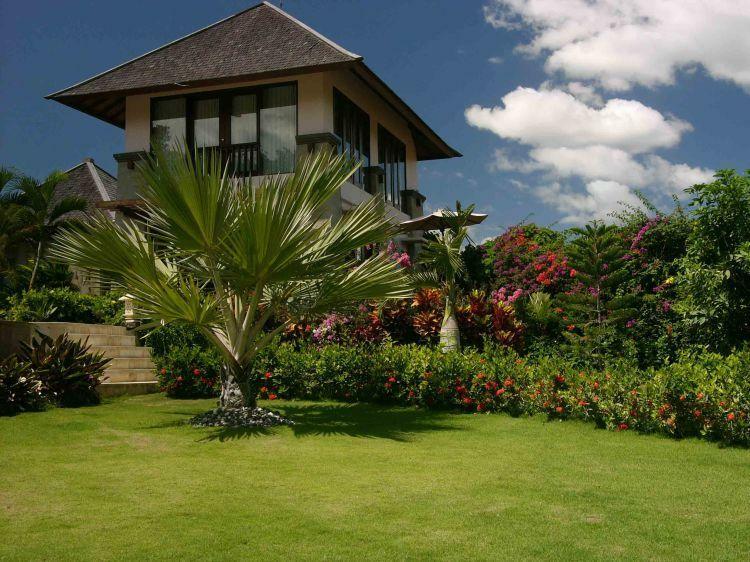 Villa Samba lies along the gentle river which flanks the western side of the property. 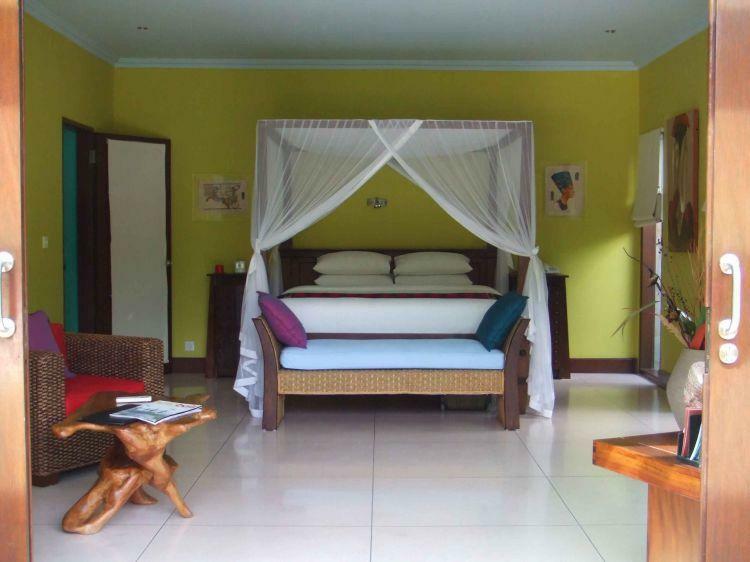 This pavilion style villa features a spacious bedroom with king size bed and canopy, lounge chairs and table, TV with DVD/CD player. Blue roman blinds and cool crème terrazzo floors create a reflective mood. The dresser area leads guests to the villa’s indoor/outdoor bathroom and private rock garden. It is designed with two showers – one indoor and one set in the white rock garden fringed with bamboo and bougainvillea, a black terrazzo bathtub, vanity and WC. 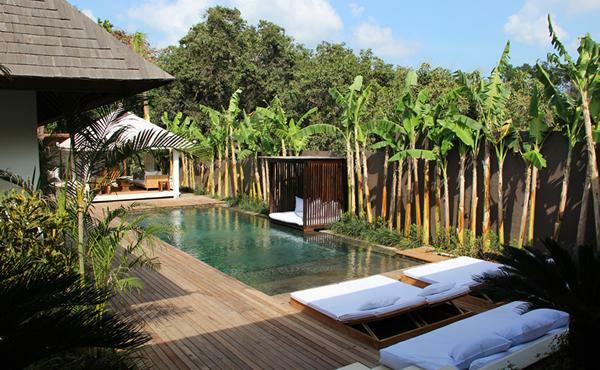 A doorway opens out onto the villa’s private open-air lounge pavilion, replete with wooden deck and private garden. Repose on the cushioned terrazzo bench seat and enjoy the peaceful tranquility of this lounge. 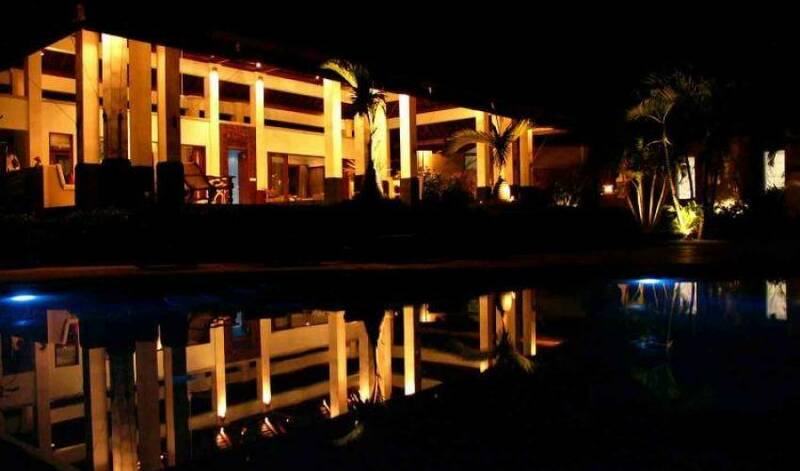 Also along the river lies Villa Rumba. 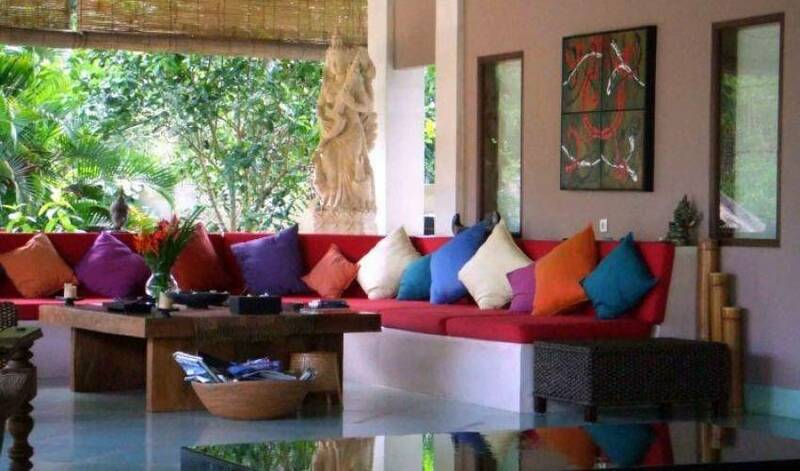 It offers the same luxurious furnishings and fittings as Villa Samba. Sea green roman blinds set a relaxing tone to unwind whilst the bathroom opens to a peaceful lava rock garden and outdoor shower. Within are featured a black terrazzo bathtub with shower, vanity and WC. To one side the wooden doors open out onto a wood deck area with table and verdant, private garden along the river. Chauffeur service. Airport transfers included.